'Hydatid' originates from the Greek word meaning 'watery vesicle'. It refers to a cyst formed as a result of infestation by larvae of the tapeworm Echinococcus granulosus, endemic to sheep-raising areas of the world. Humans are an accidental intermediary host, with lungs and liver most commonly affected. Hydatid involvement of the spine accounts for less than 1% of the total cases of hydatid disease and isolated extradural involvement is even rarer. We report a case of extradural hydatid cyst involving a boy of 5 years. A 5-year-old boy accompanied by his grandmother presented with the inability to walk for five months. On examination he was paraplegic with bedsores, increased tone, brisk reflex and clonus of the lower limbs. There were contractures of both ankles and he had no bladder or bowel control. Blood count and chemistry were normal. A serology for amoeba and cysticercosis was done that suggested past exposure to Entamoeba histolytica. Echinococcus serology was not done. Radiography of the chest did not reveal any abnormality. 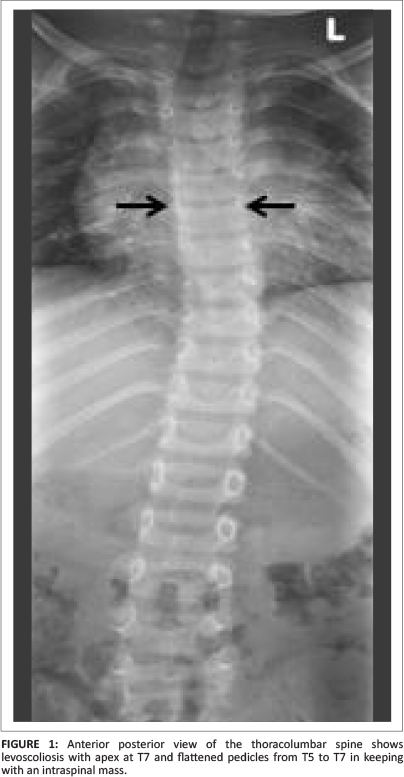 Radiography of the thoracolumbar spine demonstrated a levoscoliosis with the apex at T7 and flattening of the pedicles from T5 to T7 suggestive of an intraspinal mass (Figure 1). Computed tomography (CT) of the same area showed a widened canal with a well circumscribed oval (dome-shaped) extradural cystic mass measuring 4.8 cm x 2 cm x 1.6 cm. The cyst extended through the left T6/7 intervertebral foramen (Figure 2). There was pressure erosion of the left T6 transverse process and severe pressure effect and compression on the spinal cord with anterior displacement. A differential diagnosis of cystic neurofibroma and hydatid cyst was considered. 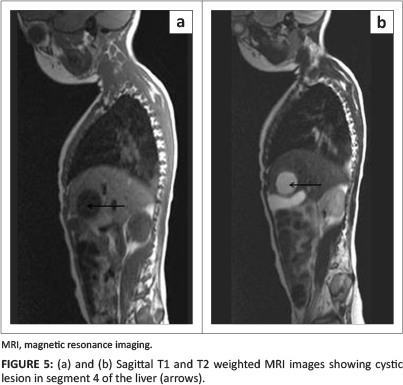 The patient was referred for magnetic resonance imaging (MRI), which confirmed an extradural lobulated cystic mass extending from T4 to T7 and extending through the left T6/7 widened neural foramen (Figure 3). There was no peripheral rim enhancement on intravenous injection of gadolinium (Figure 4). The lesion occupied the entire spinal canal with compression of the spinal cord from T4 to T8. A cystic mass was also demonstrated in segment 4 of the liver with similar signal intensity as the spinal lesion (Figure 5). These features were highly suggestive of an Echinococcus cyst, with differential diagnosis of cysticercosis, cystic neoplasm such as schwannoma, and arachnoid cyst. The patient underwent surgery with laminectomy and removal of the cyst which contained clear contents. The surgical appearance was in keeping with that of a hydatid cyst. The cyst was removed and the specimen sent for histology, which revealed an open cyst with a relatively thin wall and a laminated appearance with dense eosinophilic granular debris on the surface, features highly suggestive of a hydatid cyst. Hydatid disease of the spine affects the vertebral column in 0.2% - 1% of all patients.3 Due to the rarity of its presentation, clinicians should include spinal hydatid disease in the differential list for cystic masses of the spine causing paralysis; otherwise this potentially curable disease may be missed, or a delay in diagnosis may occur, as did in our case. Radiological examinations may be helpful in diagnosis. Plain x-rays may show peripherally calcified lesions in the liver, spleen and other organs.1 CT and MRI are the investigations of choice. The radiographic findings may be similar to those indicating tumours and infection, which makes differential diagnosis difficult. MRI is the best modality, as it shows the relationship to bony structures, the spinal cord and extension into soft tissues.2,6,8 The appearance of a hydatid cyst on MRI is quite characteristic: dome-shaped ends, with no debris in the lumen.6 The contents of the cyst have signal intensity similar to cerebrospinal fluid: low on T1W and high on T2W. The wall is sharply defined and hypointense on T1W images, which may show mild enhancement with intravenous gadolinium.5,6 Extradural cysts may spread through widened neural foramina into the muscle planes, as in our case. Hydatid disease should be included in the differential diagnosis in cases of cystic spinal cord masses causing paraplegia in endemic areas. 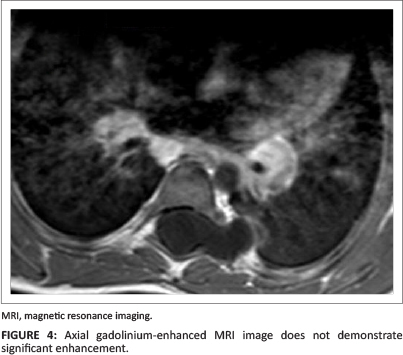 Our case demonstrates a liver and extradural lesion without involvement of the vertebral column, confirming that the disease most likely spread via the portovenous route. N.K. (Kalafong Hospital and University of Pretoria) was the project leader, whilst I.V. (Kalafong Hospital and University of Pretoria) did the literature search and editing.